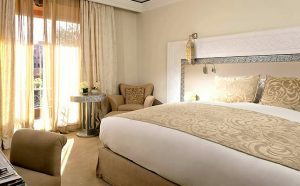 Marrakech Ryads Parc & Spa is a popular 4-star luxury hotel and resort, traditionally-designed to offer a peaceful, family-friendly base from which to explore the cultural wonders, unbeatable shopping and intriguing sights of Marrakech. 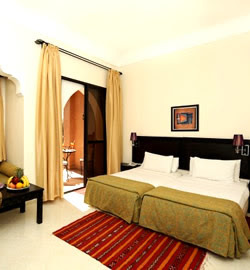 One of Morocco‘s best luxury hotels, Marrakech Ryads Parc & Spa is home to 260 light and spacious rooms, distributed across 13 ryads in keeping with traditional Moroccan architecture. 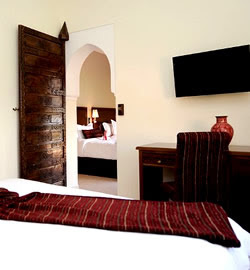 Each air-conditioned room includes satellite TV and a mini bar, plus a private balcony or terrace from which views of either the swimming pool, lush gardens or dramatic Atlas Mountains can be enjoyed. With its huge outdoor swimming pool, children’s pool and terraces, guests at Hotel Marrakech Ryads Parc & Spa can soak up the year-round sunshine before cooling down with a refreshing dip. For a respite from the Morocco sun, head to the hotel’s additional indoor swimming pool or unwind with a cocktail at the poolside bar. For the ultimate in relaxation, the hotel’s renowned EDEN Spa is on hand to provide a wide range of treatments. This sensation wellness centre offers multi-sensory spas and a spectacular range of treatments and facilities that focus on the five elements of the Earth. Spread over 27m² with a subtle blend of neutral and traditional décor. It offers a private bathroom with a bath, satellite TV etc. 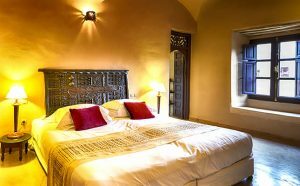 These are light and airy rooms that include a private bathroom with a bath, satellite TV, air conditioning, telephone and a mini bar. 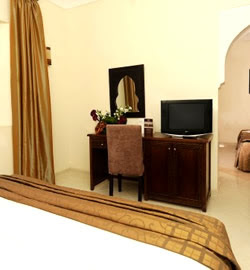 Family Room are spacious, light and comfortable, the perfect choice for a group or family. 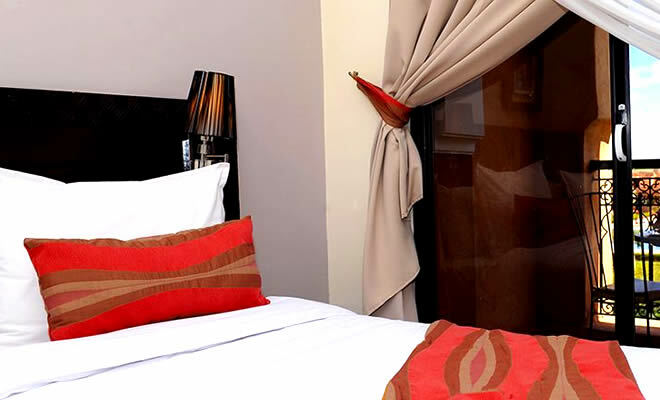 It offers a double bed & two singles. Spacious, light and comfortable, the perfect choice for a group or family. 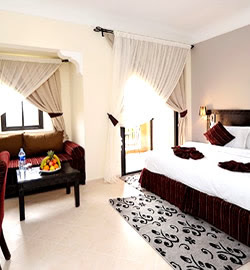 It offers a double bed, two singles, and optional sofa bed. 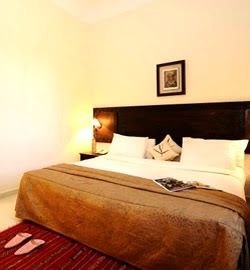 Enjoy 36m² of traditional indulgence, the ultimate choice for space and comfort. Maroc. Near new football stadium.